This morning, bright and early (probably a little *too* early after last night’s lovely Christmas dinner with some excellent friends!) and in the freezing cold, I got my smoker out and set up. For the past couple of weeks, my fridge has been half full of partly cured pork products. Well, the curing finished last week, and today it was time for some smoke! 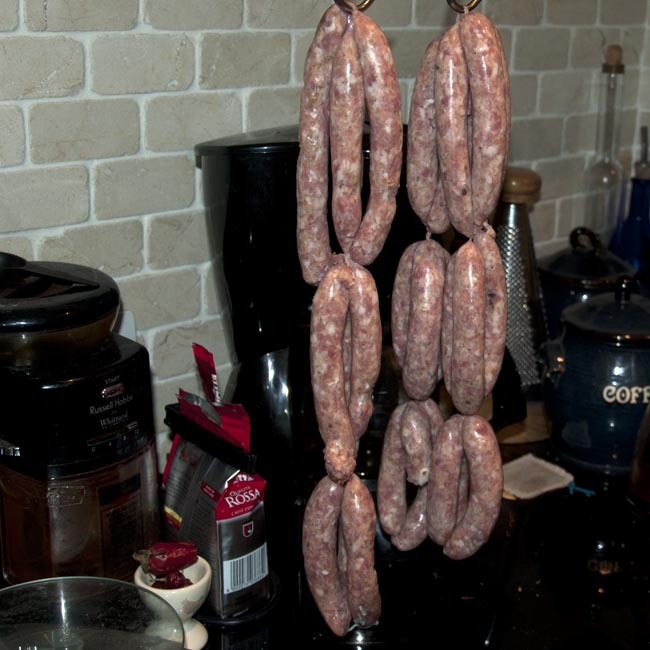 What you can see hanging there is my boxing day ham, and a batch of Christmas streaky bacon. For more information on my DIY cold smoker, you can have a look at the smoking and curing posts, collected here. 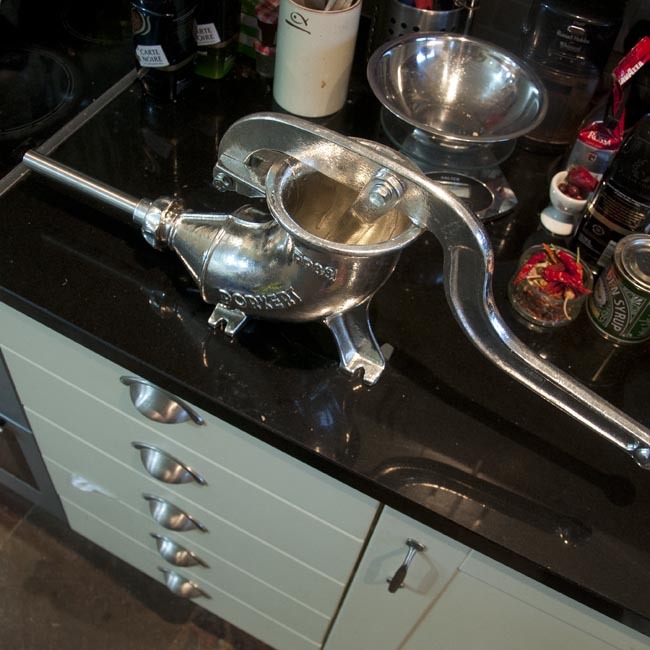 For suggested UK supplies of smoking and curing ingredients and paraphernalia, have a look at my suppliers list. The little sawdust-burning ProQ cold-smoke generator has served me very well in the course of the last year or so, but we had a bit of excitement with it this morning, after the tea light which is used to start the sawdust smouldering decided to overheat and do a striking impression of a miniature chip pan fire! 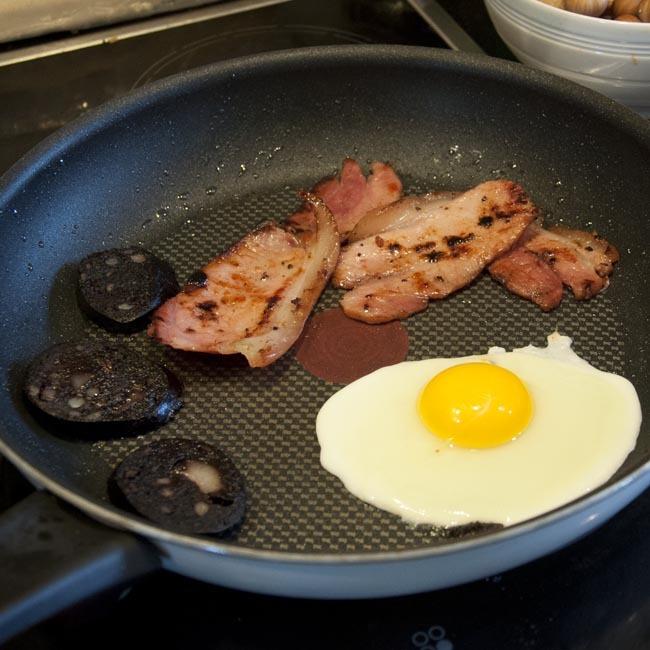 You’ll be relieved to hear, I’m sure, that no serious harm was done to the bacon, and that I still have my eyebrows! It was however alarming enough that I’m going to look into alternative ways of starting the smoulder in future. The amazing colour of the ham comes from the same treacle-based cure I blogged about using earlier this year, though in deference to the larger piece of pork leg, and the fact that this time, it has the bone in, I allowed a curing time of 10 days. The only other change was the addition of a couple of fresh bay leaves to the curing solution. 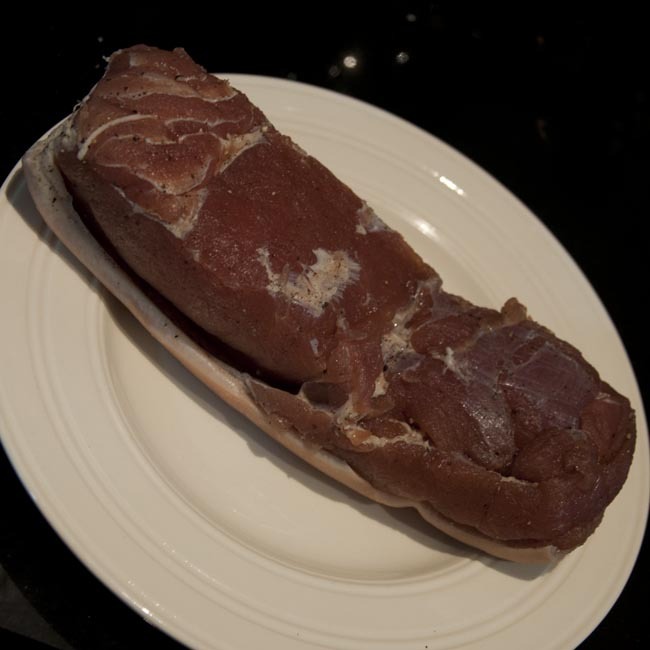 The gorgeous 2.5kg piece of pork leg came from our local farm shop butcher, who has wonderful meat. Between now and Boxing Day, once it’s rested for 48 hours to let the smoke flavours permeate, I’ll wrap it up and put it in the freezer. 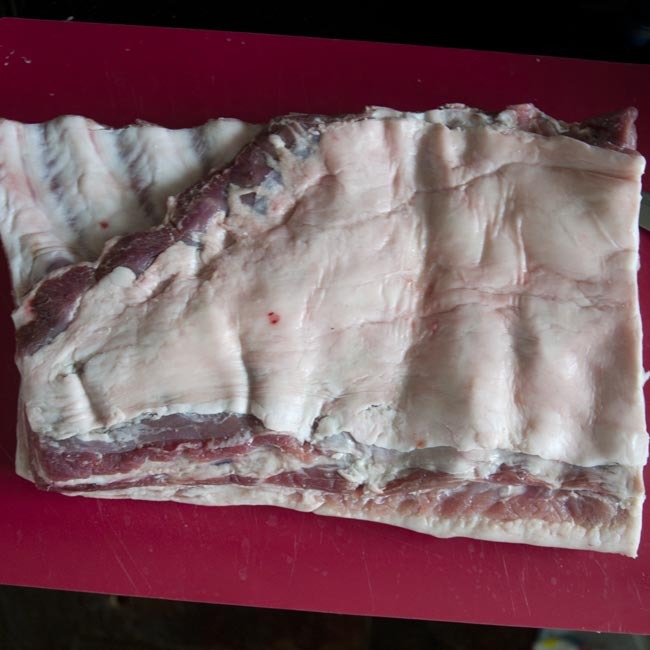 I’m expecting that, once boiled and glazed, it will look a lot like this – I can’t wait to see what difference the smoke makes! The bacon is mostly intended for gifts (except for the biggest piece, which is mine-all-mine!). It was a great success last year, and seemed popular with its recipients! 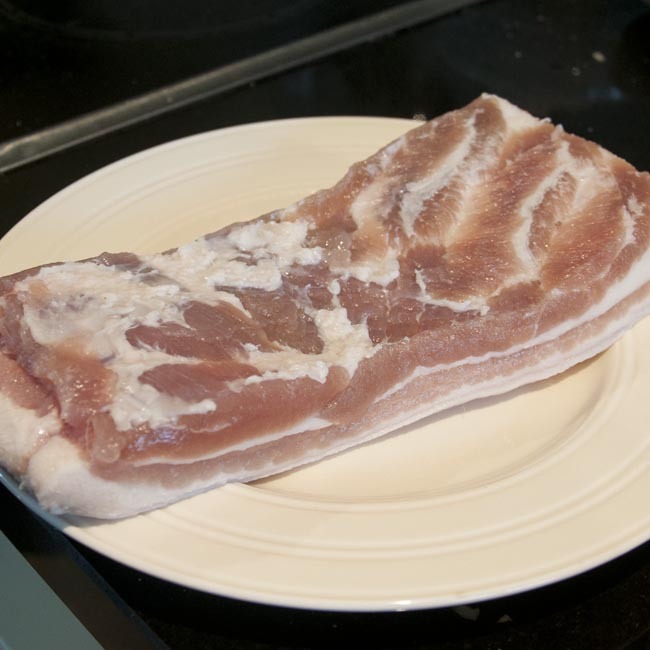 It’s been curing over the last week, using a bacon-in-a-bag technique I’ve been refining over the last year. 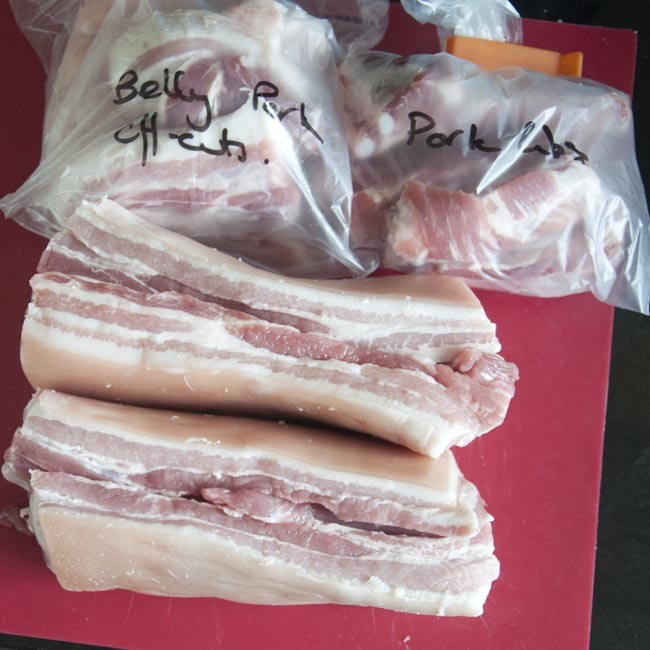 Nearly all my home-cured bacon is made this way now, and I’ve settled on an 8% cure for most purposes, made up with between 66-75% curing salt and 25-33% sugar. 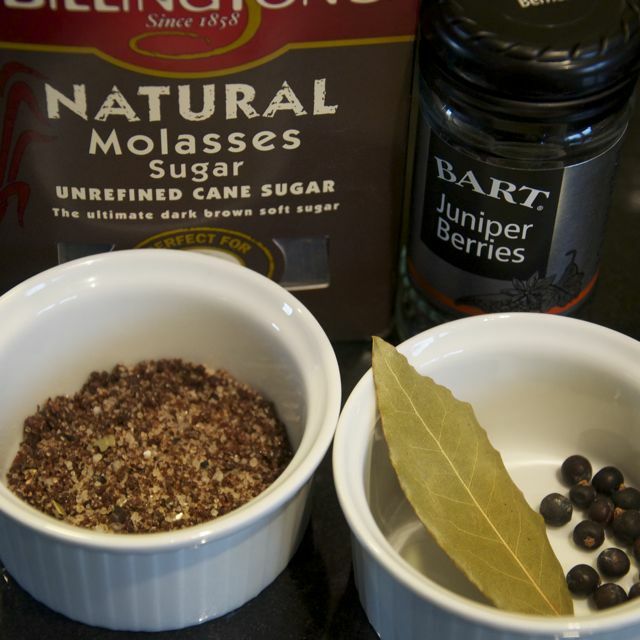 Grind up all the spices in a spice grinder (except the nutmeg, which you’ll probably be safer grating by hand), and then mix the spices into the salt and sugar. 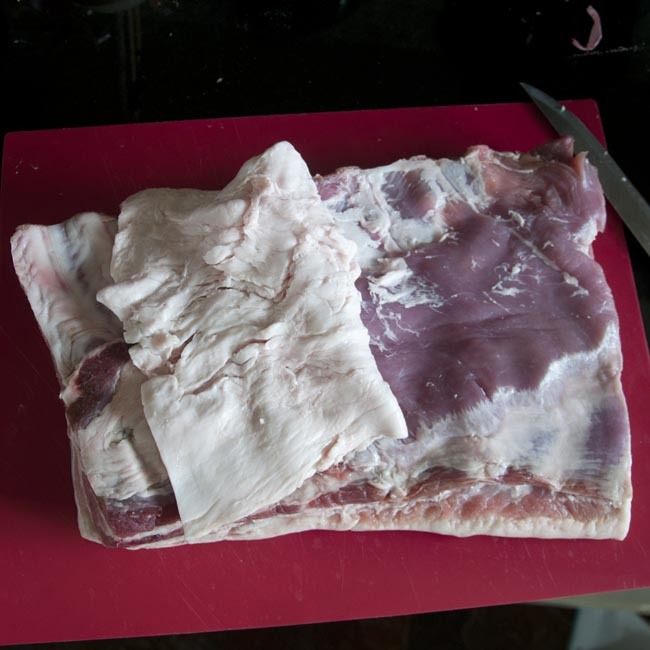 Prepare the pork belly by trimming it if required and then slicing into the appropriate pieces. 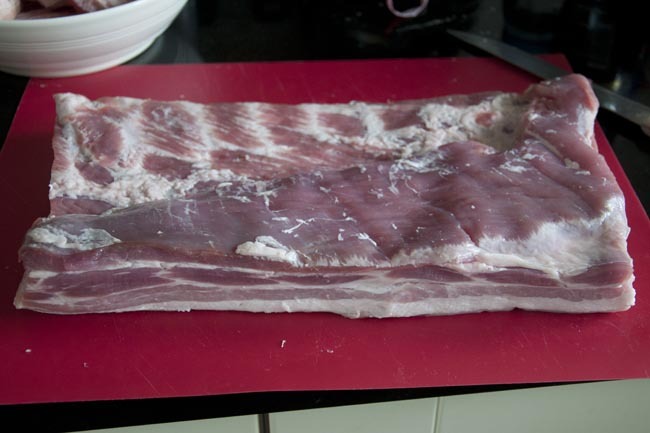 Now rub about half of the cure generously over all the surfaces of the pork, and pack it into the freezer bags. Put these in the fridge and turn them over at least once a day, alternating which one is on top if you have more than one bag. 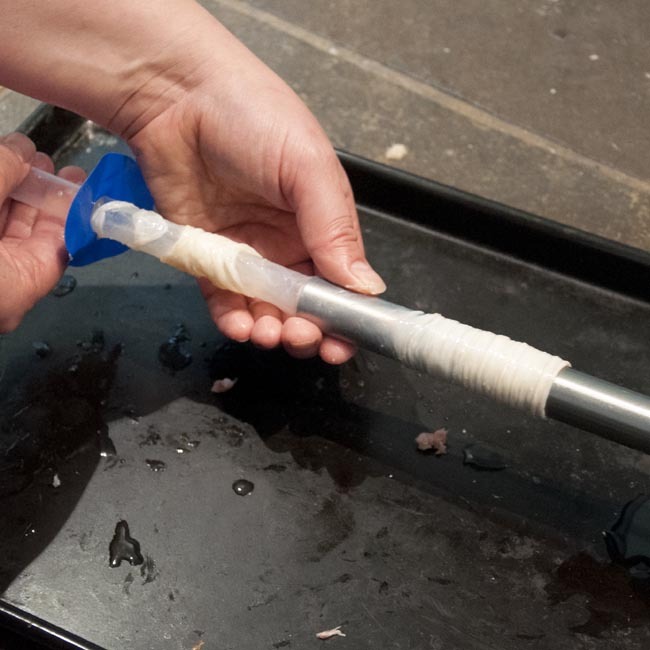 In two days (three if you’re using pork loin rather than belly), pour off any liquid which has accumulated in the bag – this may be very little if you started with excellent quality meat that hasn’t had water added! 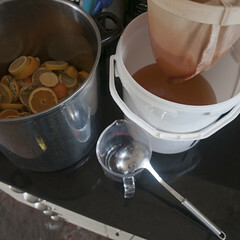 – and apply the rest of your cure mixture before returning to the fridge for a further 3 days, turning daily as before. 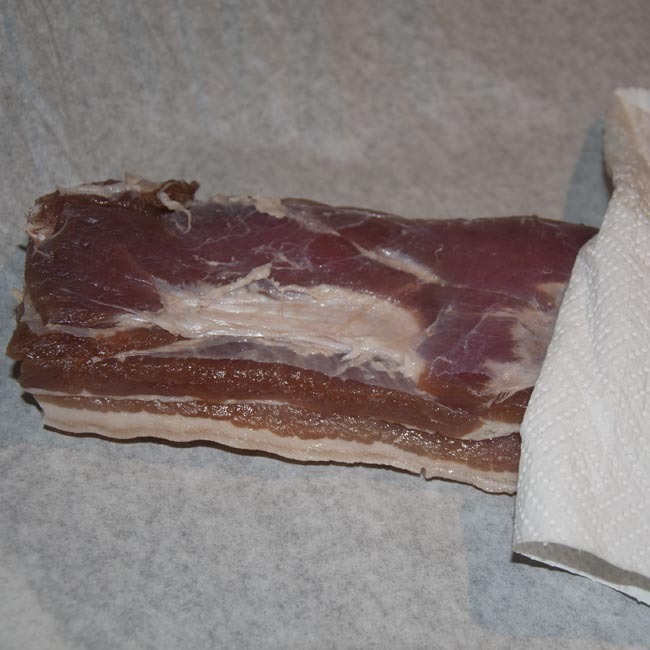 After your 5 or 6 days in total have elapsed, take the bacon out of the bag, rinse it carefully under cold tap water, dry with kitchen towel, and place on open racks or uncovered on plates in the fridge for another day (or ideally two) to allow the pellicle to form – this is a sticky glossy surface which will develop on the surface of the bacon. 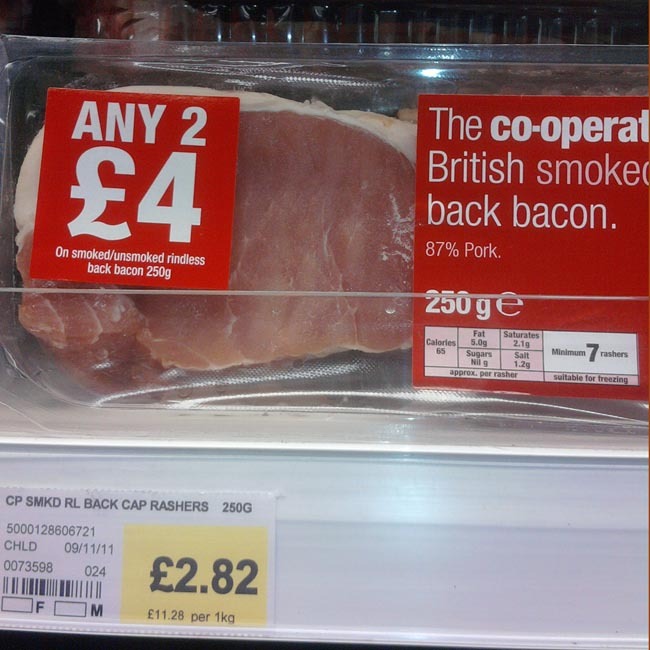 Then, you can eat your bacon, or, as I did today, smoke it. 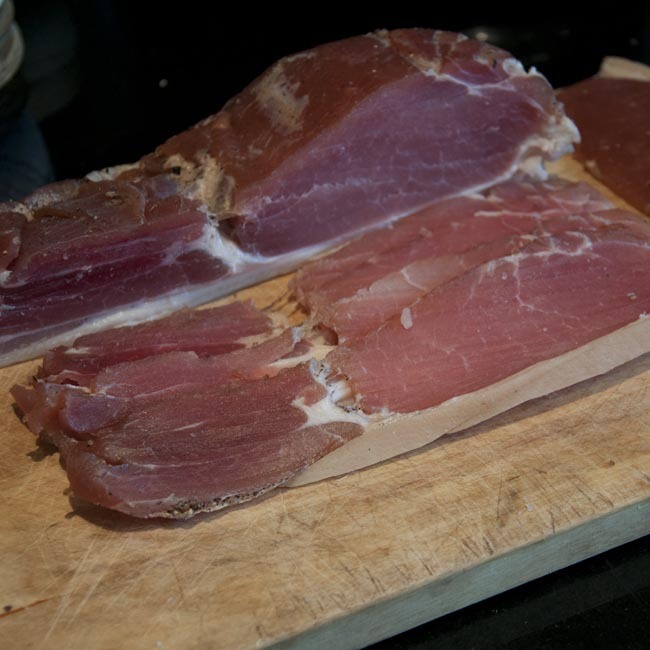 I’ve used a mix of beech and apple sawdust for todays smoke run, it gives quite a strong, aromatic smoke which I think will stand up well against the robust flavours in both the ham brine and the bacon cure. 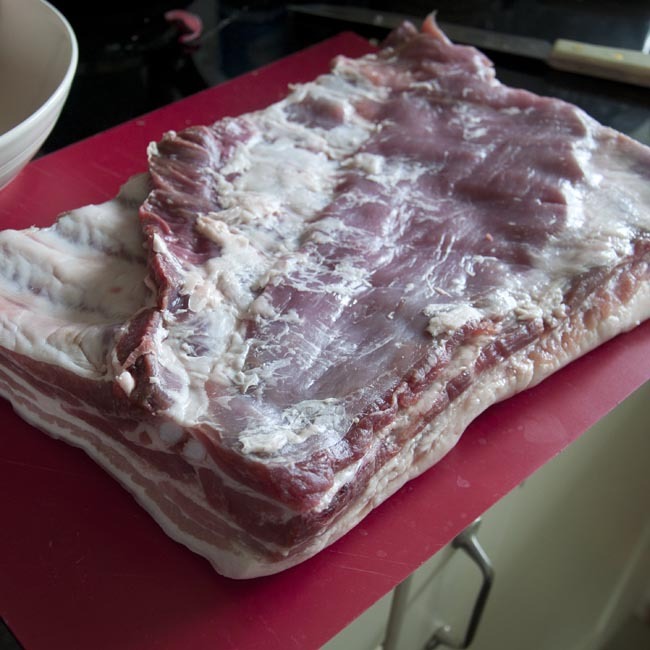 The bacon will be frozen, wrapped as individual pieces in waxed baking paper, until we use ours to make our pigs-in-blankets on Christmas day (it was amazing last year! ), or give it as gifts. Offal certainly divides opinions! 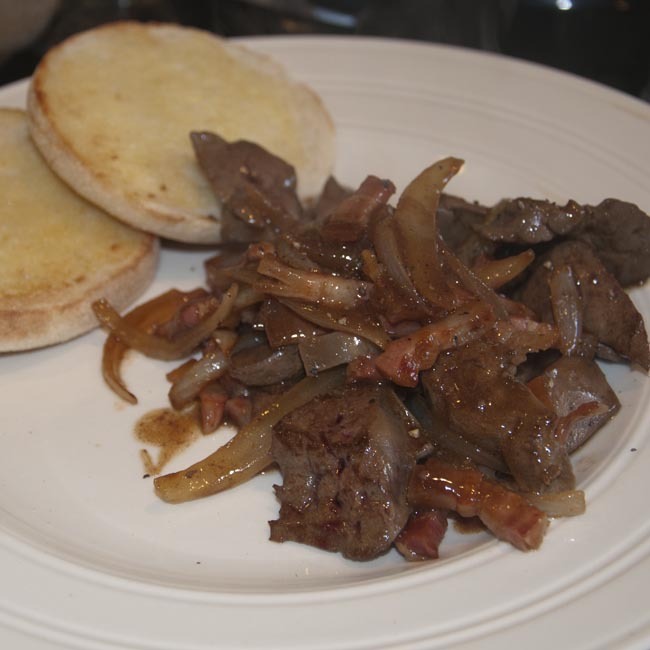 One of my favourite ever dishes is liver, bacon and onions – so simple, really just three ingredients – I’ll order it in a pub whenever it’s on the menu, but sadly it’s often a disappointment. When it comes to liver, freshness is everything. It doesn’t reward maturation! 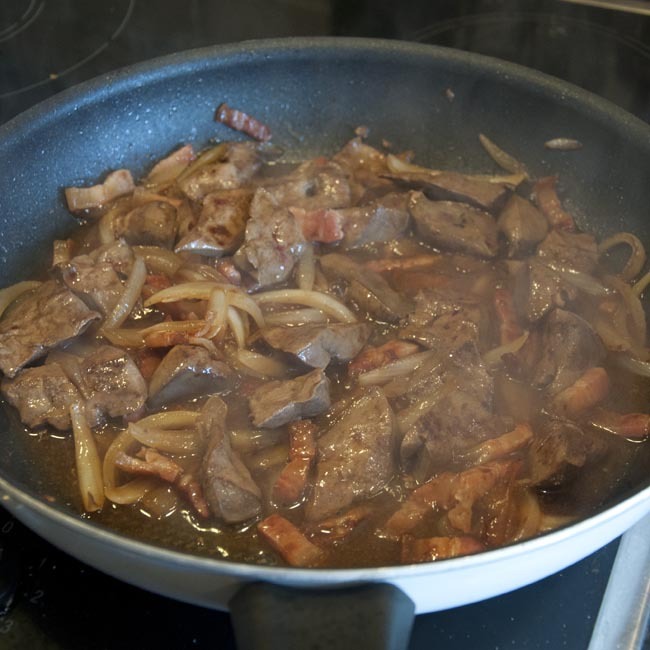 Lamb’s and calf’s livers are the ones to choose – pig’s liver has a nasty bitter flavour, which some people seem to believe can be mitigated by doing things like soaking the liver in milk before cooking. Don’t bother! 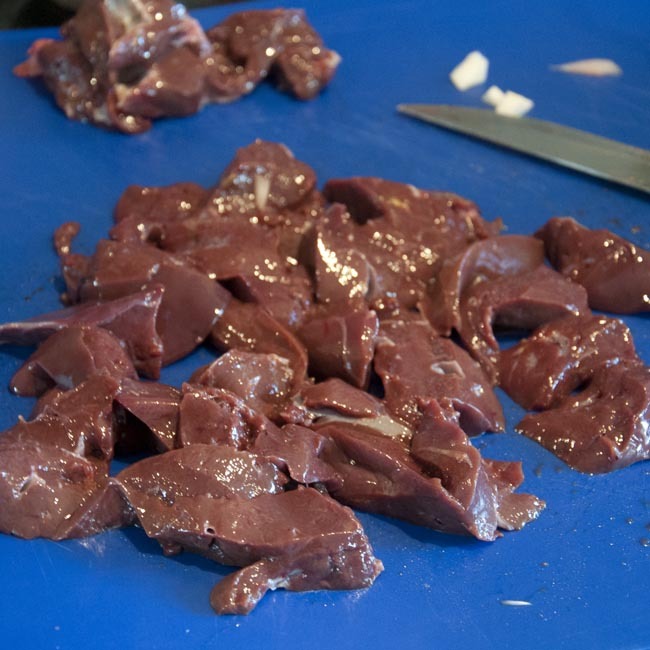 Get the best, freshest lamb or calf liver you can, it needs very little preparation, and makes a wonderful meal. 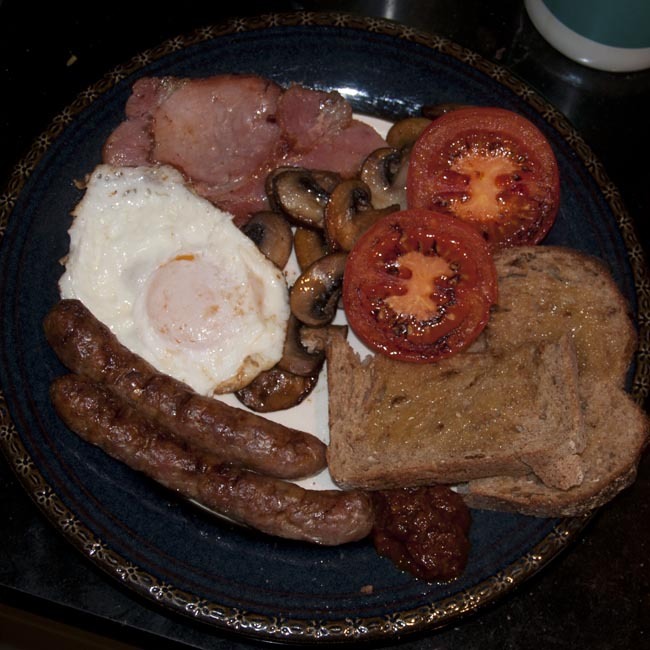 As much of our meat as we can manage comes from the little farm-shop butcher just up the road from us. 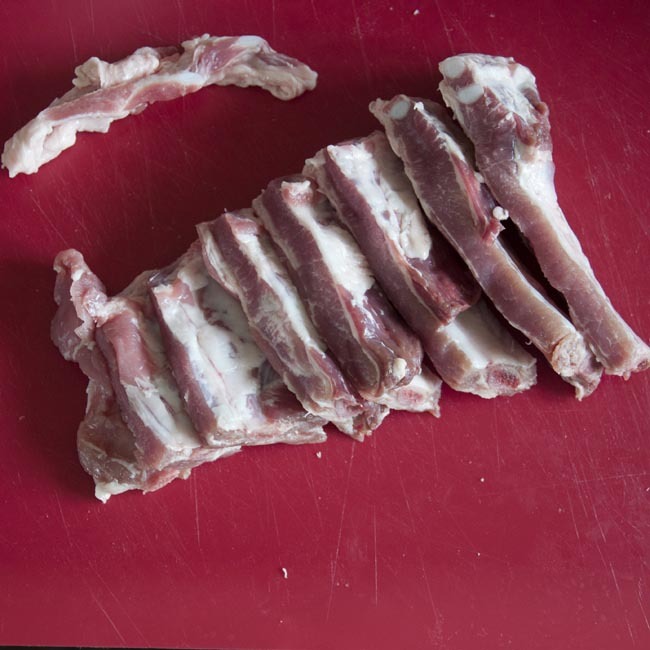 Chris, the butcher and farmer, knows us quite well these days – so when my husband was in there last week, Chris happened to mention he’d just that very day come back from taking a few lambs in to slaughter. He had the ‘plucks’ (the slaughterhouse term for the heart, lungs and liver). 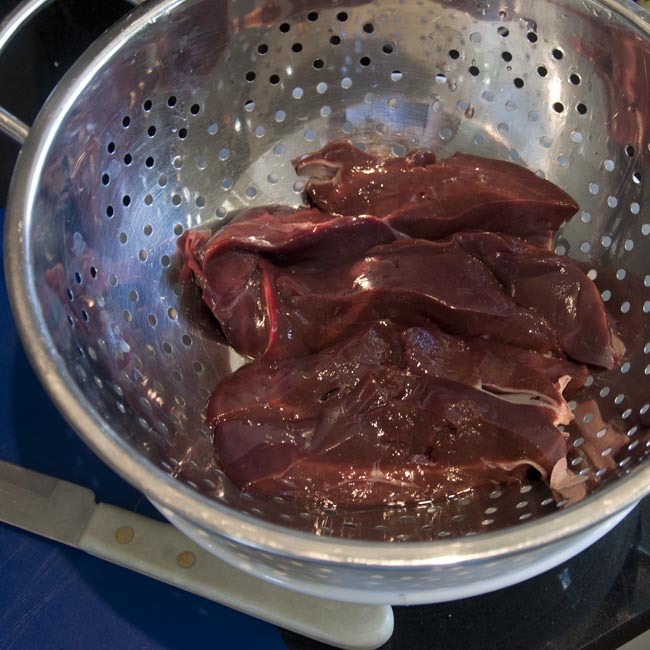 A lovely fresh lamb’s liver, inevitably, made its way into the shopping bag! Good fresh liver is dark burgundy in colour, firm but yielding in texture. There will probably be some blood in the packaging, wash this off and pat it dry. 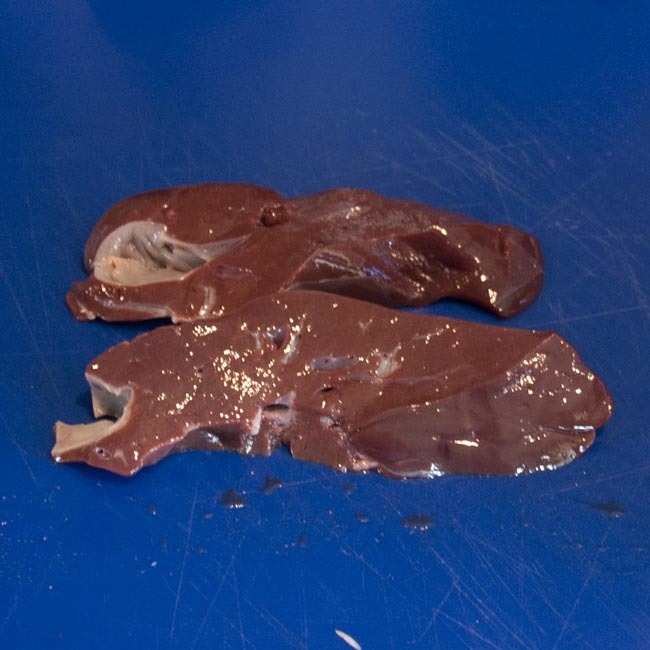 Fresh raw liver has almost no smell. 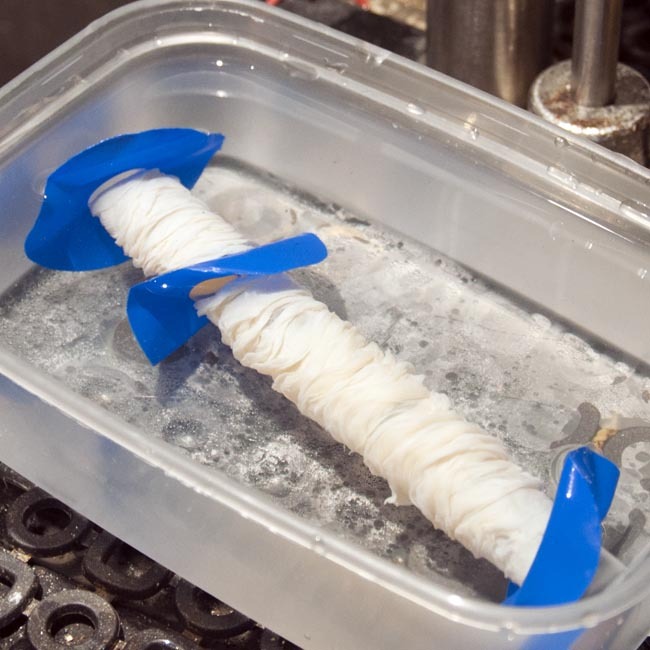 It shouldn’t be mushy, crumble, or disintegrate under gentle pressure – if it does, then a process known as ‘autolysis’ has started, and the liver is starting to break down. Blotchiness and pale areas can also suggest less than ideal freshness, or issues with the health of the liver. This liver, in thick slices, was beautiful. There will be some fibrous tissue in the liver, you can trim this away as you slice the liver into pieces. I like my liver in bite sized pieces, cut on the diagonal from the original thick slices. 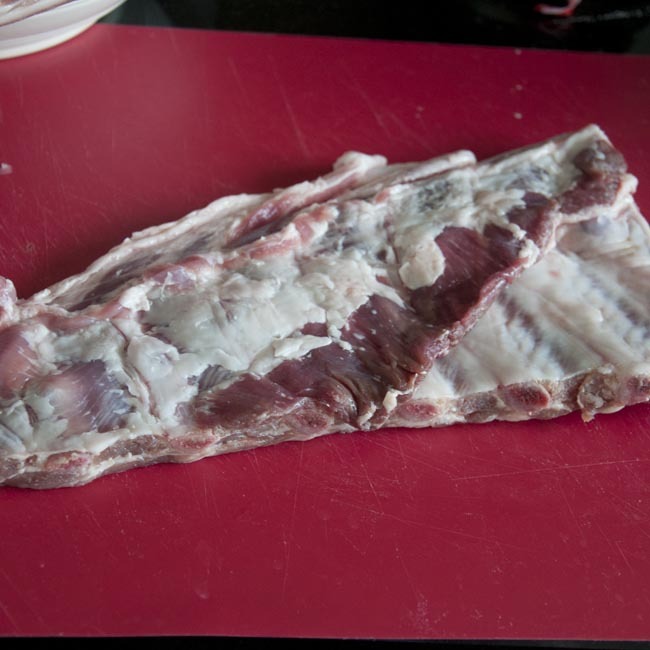 Try to keep the pieces as even sized as you can, so they will cook evenly. Decide what you want to serve with your liver, bacon and onions – mashed potato is traditional, but don’t let that stop you. Ours was for lunch, so we enjoyed it with a little gravy, and warm buttered toasted muffins. If you want side dishes, get started with those first – the liver will take less than ten minutes, and you want to serve it as soon as it’s ready. 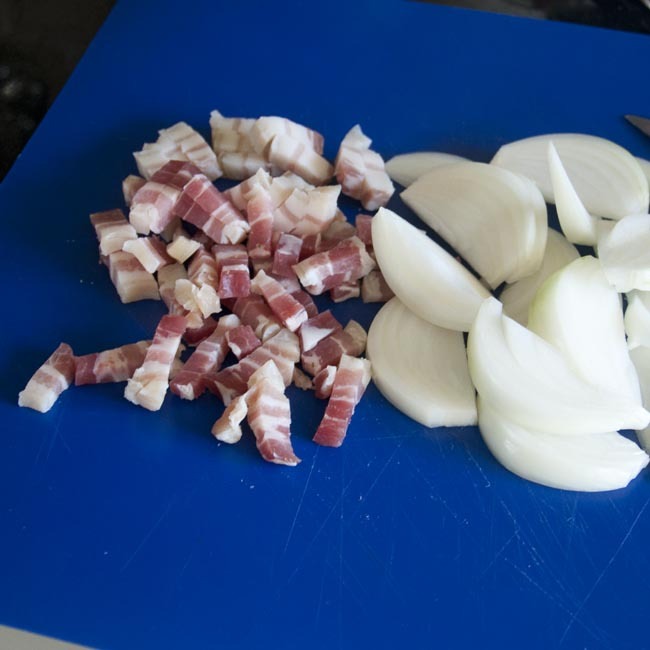 Slice an onion into thin slices from tip to root, some dry cured bacon into pieces. 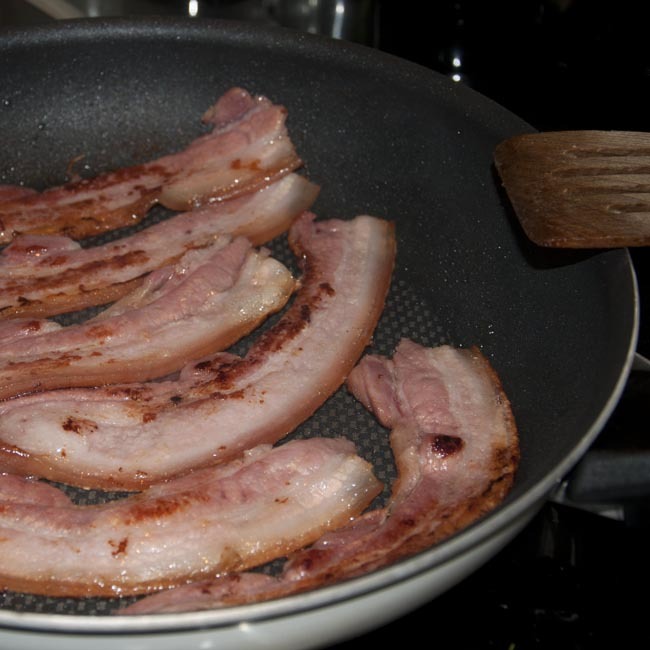 Use the very best bacon you can – my home-cured maple bacon is perfect – the last thing you want is that nasty bacon-water from commercially produced bacon leaking out into your pan. 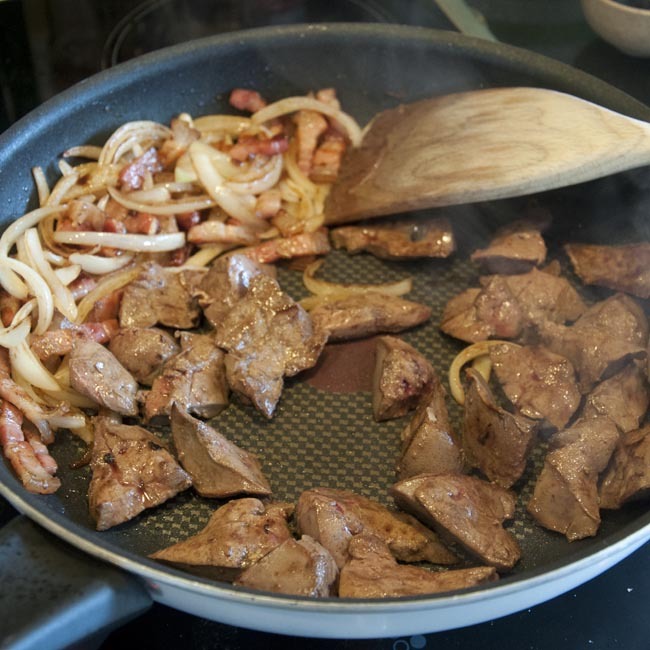 Fry off your bacon and onion in a large frying pan until starting to caramelise. Add a very little bit of olive oil if you need to. Once it’s starting to show a little colour, push it to one side in the pan. 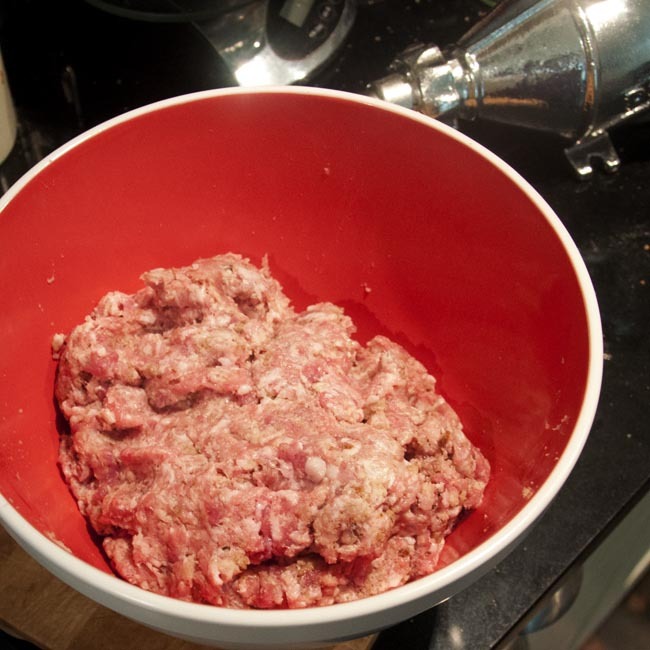 Now add the liver and fry off until the pieces are just a little bit pink in the middle. 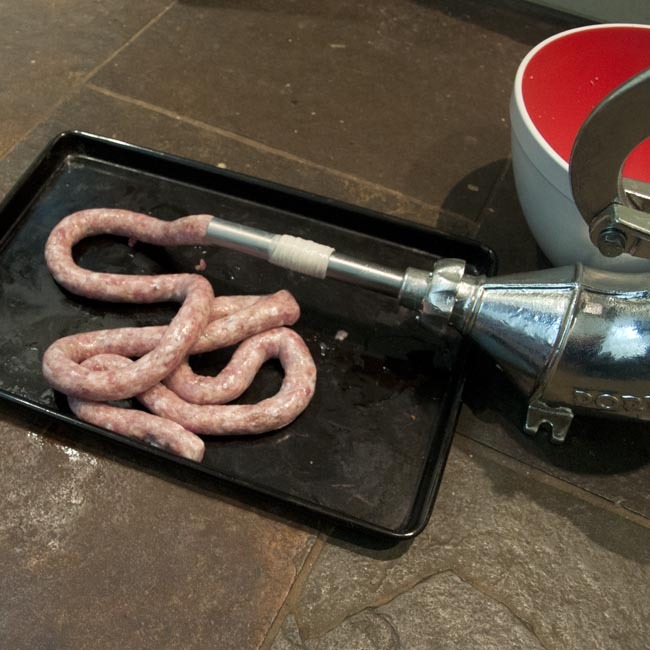 You’re nearly done – just time to make the gravy. 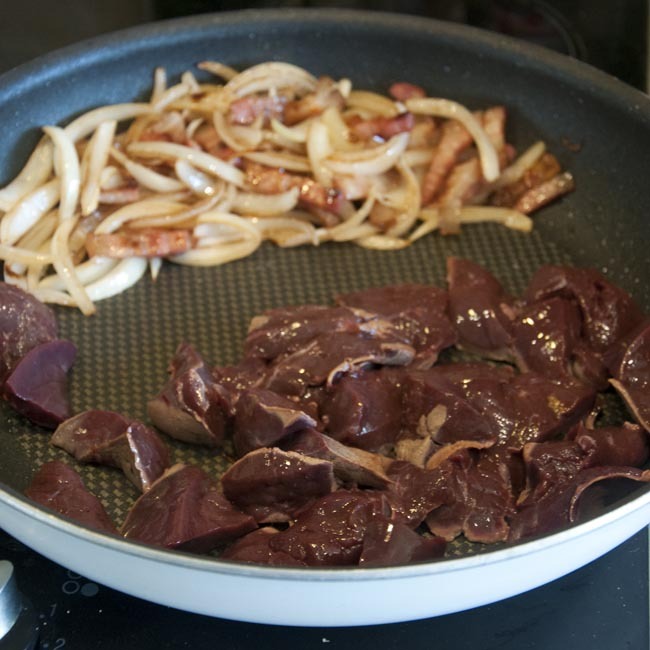 Mix the onion and bacon back among the cooked liver. 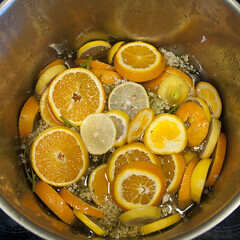 Now add a generous splash of boiling water to the pan, and stir it all around to capture all the lovely pan flavours. If you want your gravy a little thicker, thicken it by your preferred method. Gastropub recipes often have red wine in the gravy – I’m not sure this is an improvement, simplicity is everything here! 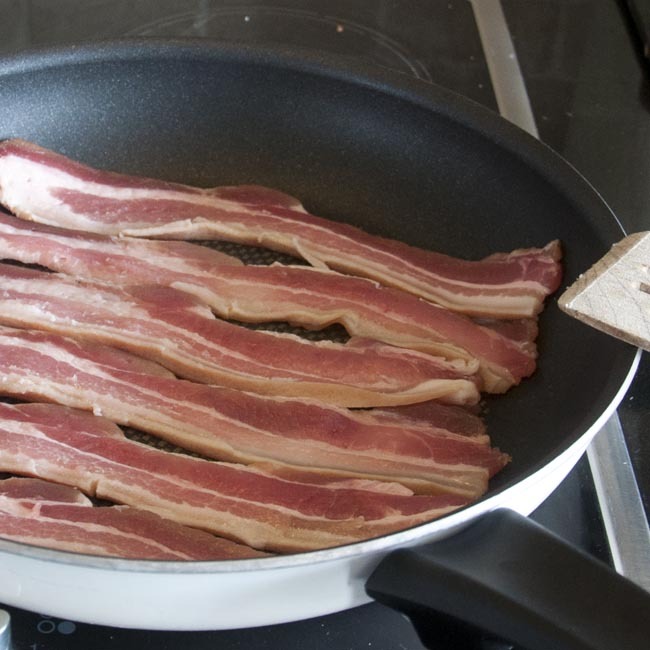 You probably won’t need to add any salt – the bacon has enough – but season with pepper to your taste. Serve, and enjoy! This is such great comfort food – it’s food for the soul as well as the body! 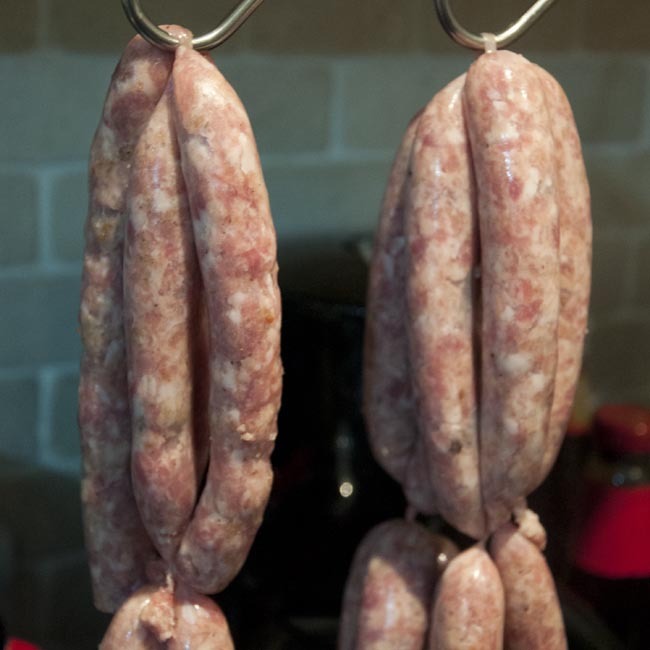 And a timely reminder to me that I need to remember to enjoy offal much more often! 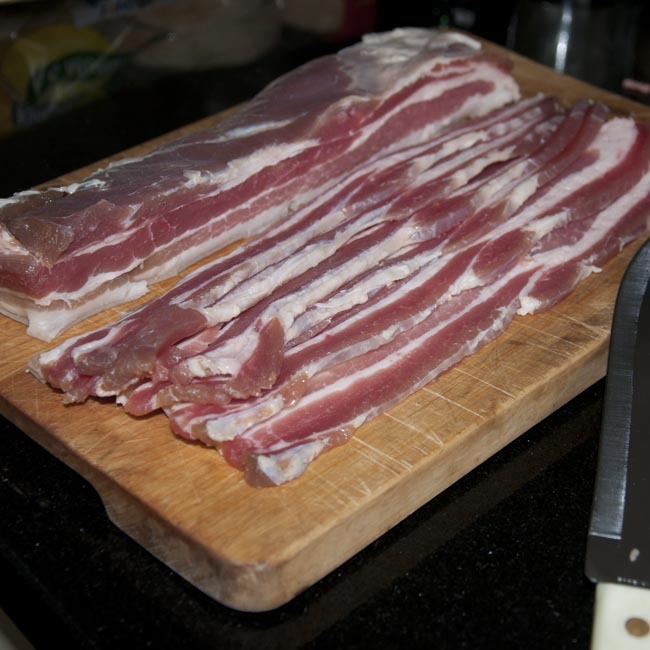 Every so often I ask my lovely husband for ideas – most recently last time I was making streaky bacon. ‘What cure shall I use?’ I called out from the kitchen. ‘Maple!’ he replied. Right oh, maple bacon. It’s a new one for us. I ferreted around in the cupboard and dug out a bottle of pure maple syrup. This was sounding plausible, after all! 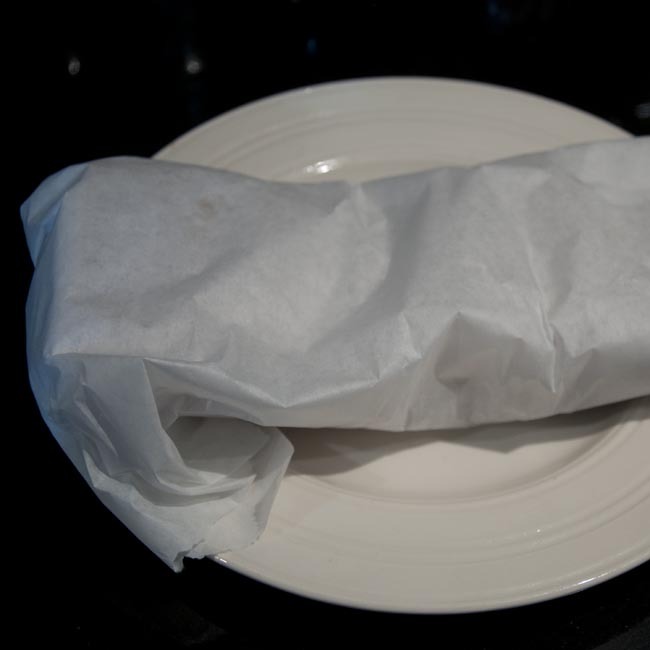 A plastic bag big enough to contain the pork, and a sealed container for the cure. I was aiming for an 8% total cure weight to the meat (lower than the 10% I normally use), with a 1/3rd to 2/3rd ratio of sugar to salt. This was in deference to the rather aggressive salt flavour I got from the outside pieces of my last bacon-in-a-bag effort. I got the ratio right but slightly overcooked the total quantity, in this event. You’re thinking now that my arithmetic doesn’t add up, and that 56g is clearly well over 10% of 480g. You have to consider that maple syrup is about 40% water to 60% sugar (check the nutritional analysis on the back of the bottle for your particular sugar) so my 26g of syrup is in effect 15g of maple sugar, for a total dry-equivalent cure weight of 45g or ~9%. The mix of salt and syrup is not so much a dry cure, more of a ‘gloop’. 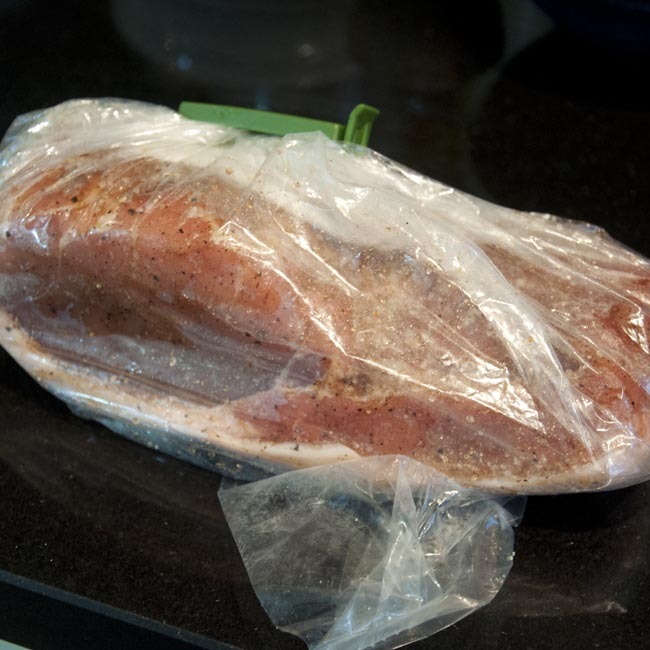 Put the pork in the plastic bag and rub all over with half the cure, massaging in well. 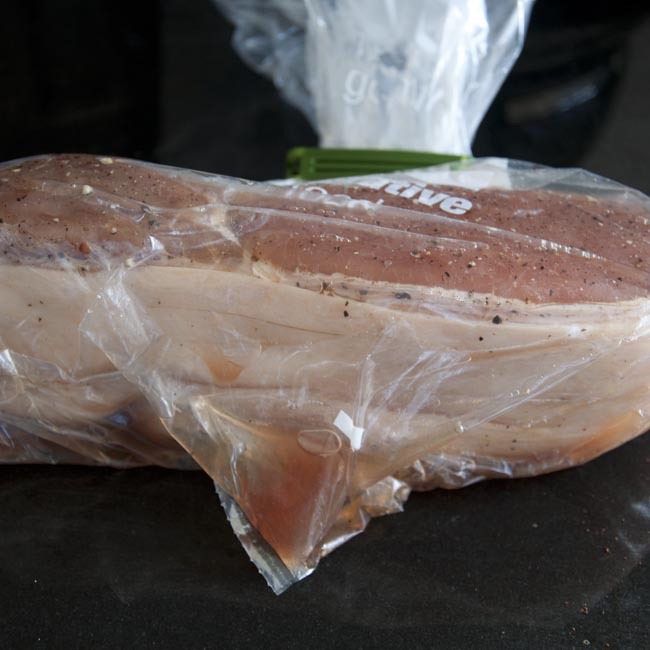 Seal the bag, excluding as much air as possible, and place it in the refrigerator. Store the rest of the cure in an airtight container. 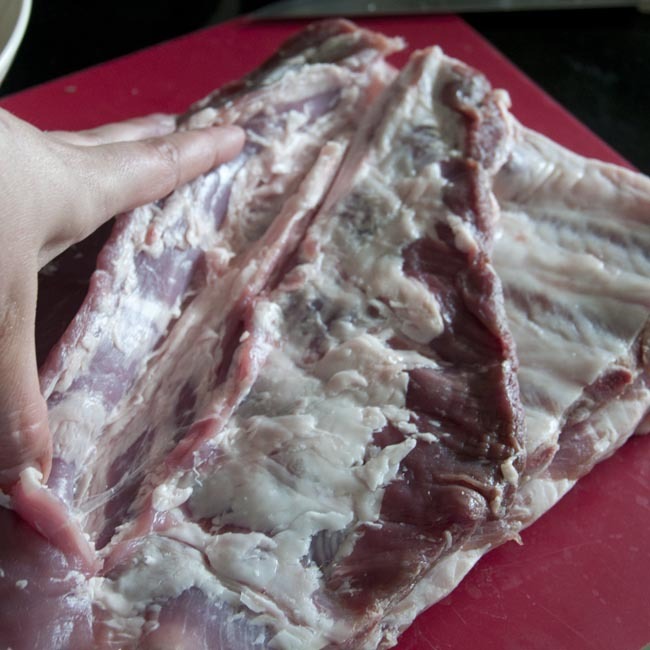 At least once a day (but in practice I tend to do this whenever I’m going to the fridge and remember) give the meat a bit of a massage, and return to the fridge the other way up. After two days, I poured off the pickle, and applied the rest of the cure. 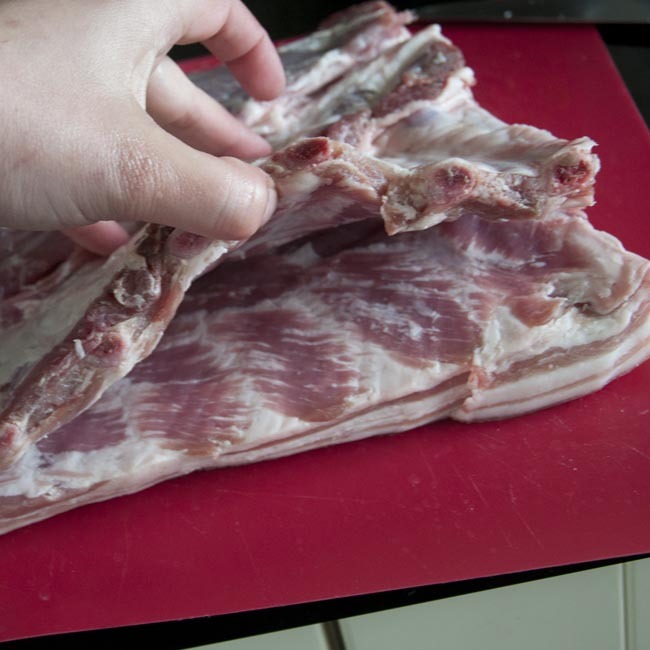 After three more days (a total cure time of 5 days), remove the bacon from the fridge, rinse it under cold running water, dry carefully with kitchen paper and then wrap loosely in baking parchment and return it to the fridge for at least 24 hours (and preferably a few days) to rest. 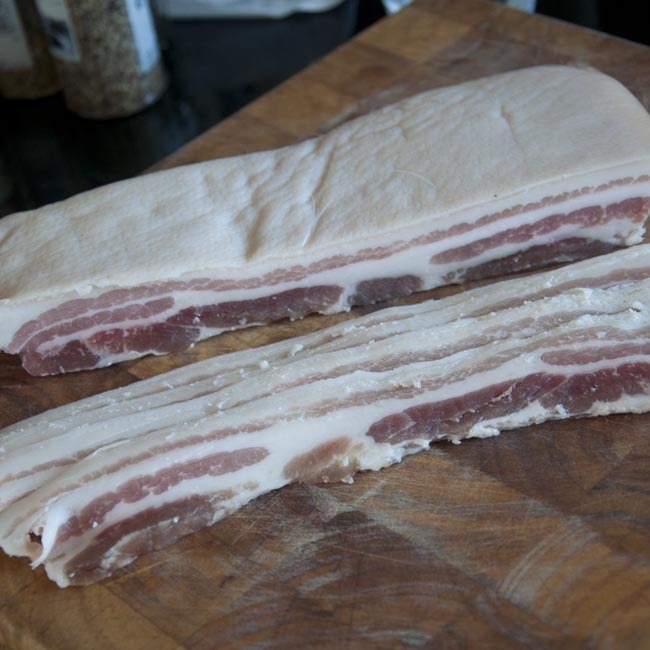 You’ll notice that compared to our previous bacon, this one is a lot paler in colour, and retains a much whiter rind. 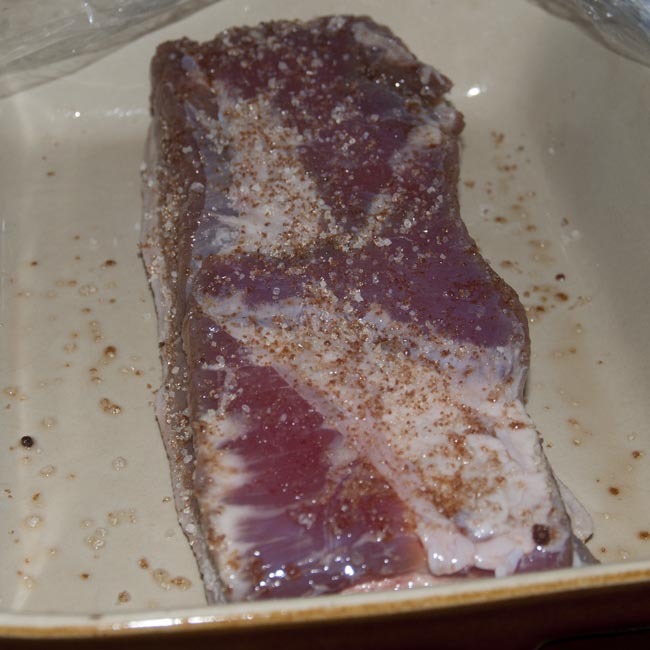 Most of the change in the meat before and after curing is in the texture, with a slight pink flush to the meat. This is because we’ve not added colour by using a dark sugar in this cure. It slices very nicely! 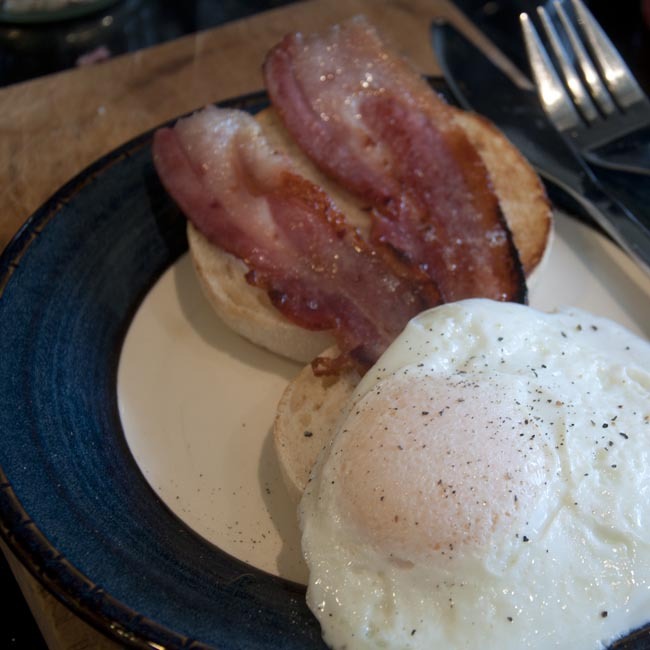 At this time of year, with the warmer weather, perhaps you don’t fancy a bacon roll so much as in winter? For lunch on a hot day, I love a spinach and bacon salad. It’s the quickest and simplest of light summer lunches. 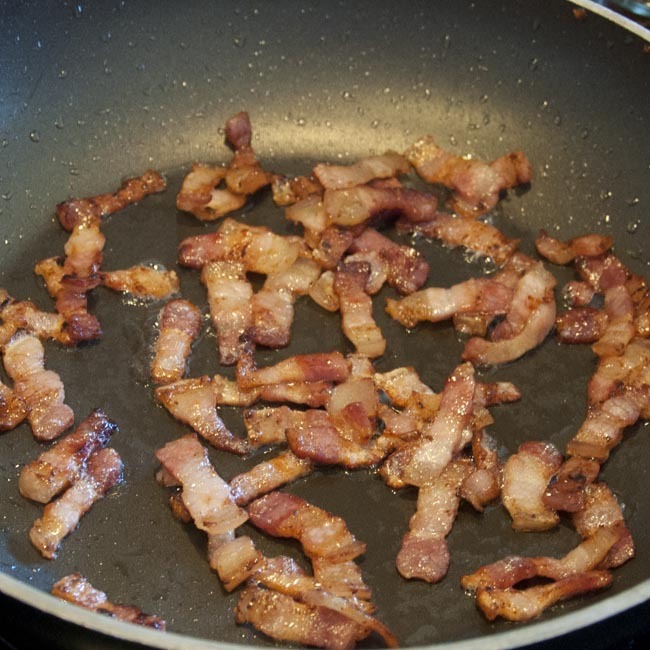 First slice your bacon into lardons, and fry it off until slighty crispy. 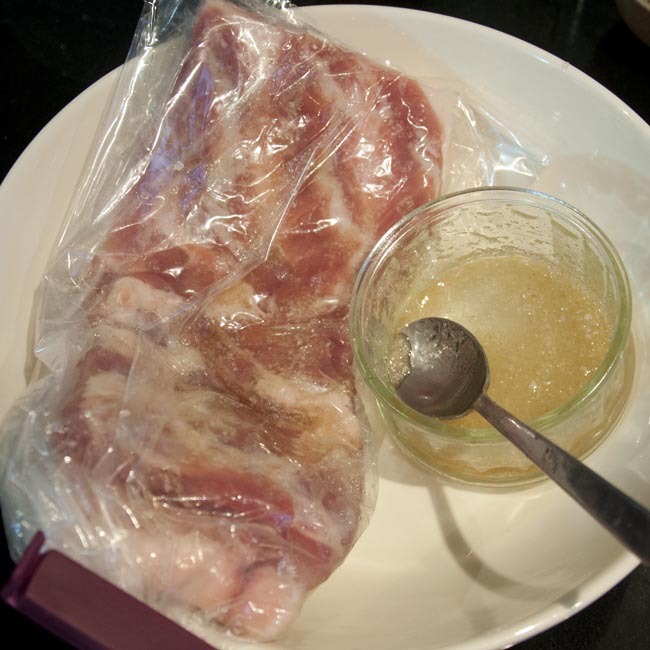 This bacon cooks beautifully, caramelising very rapidly and rendering off lovely clean clear bacon fat. Then, toss your crispy bacon pieces, while still warm, into a big bowl of baby leaf spinach, dressing with balsamic vinegar and olive oil. Doesn’t it look appetising?? It didn’t last long here! We had a few more rashers for breakfast this morning. We will certainly be making this one over and over again in the future. 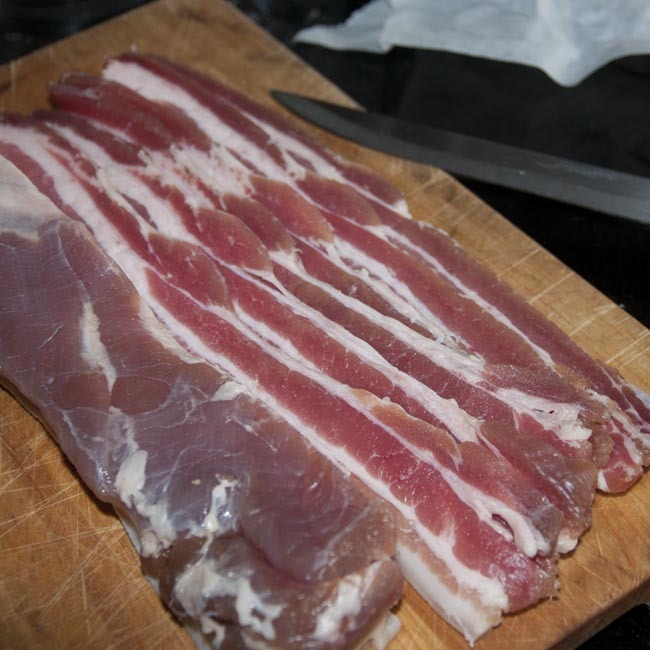 In summary – this is great bacon, subtly flavoured, gently salted, with a gorgeous traditional bacon flavour. Make it! A few weeks ago now, all my lovely volunteers for the Big Bacon Challenge made their first batches of home-cured streaky or back bacon. 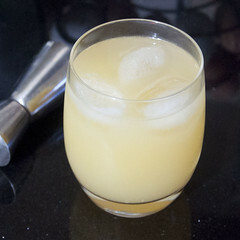 Several of them have blogged about their experiments, so I’d like to bring together some of their comments and reports. 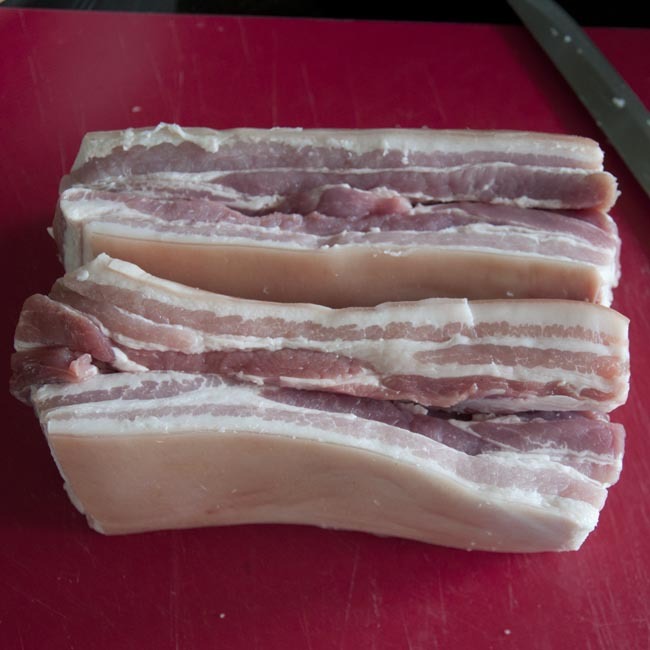 I wanted to show as many people as possible that making your own bacon at home is not only incredibly simple and straightforward, but produces some of the best bacon you will ever have eaten – these reviews I hope go some way to supporting that! 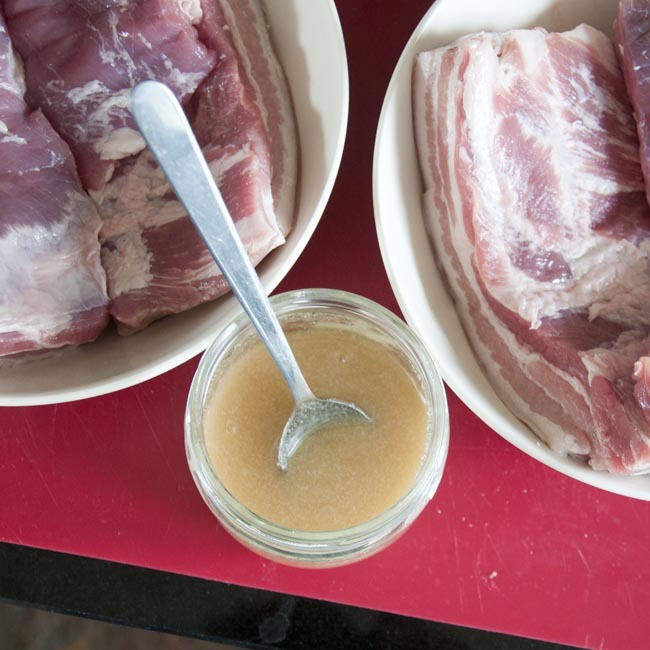 I’m informed by several of my volunteers that they have since bought their own supply of curing salt and continue to make home-made bacon (and other goodies! ), so I’m declaring the challenge a success! A great big THANK YOU to all of my volunteers, and if any of you have any further feedback, please do comment or email so that I can include it here!